At the risk of sounding like your local Public TV or NPR outlet during fundraising, we want to encourage you to do the FWC a HUGE favor by becoming a monthly donor at whatever level feels comfortable to you. In a parallel to stream ecology, a steady, reliable flow of donations every month (Our goal is $2500 a month) would make meeting our monthly expenses much, much easier and less stressful when unexpected costs pop up. While the donation stream flows nicely after we send out fundraising requests, you can appreciate how it might get a bit dry in the summer months. We are not asking you to contribute more than you already are (although if you could it would be wonderful ;-) ! ) - rather we are asking you to consider spreading your gift to FWC out over a full 12 months. 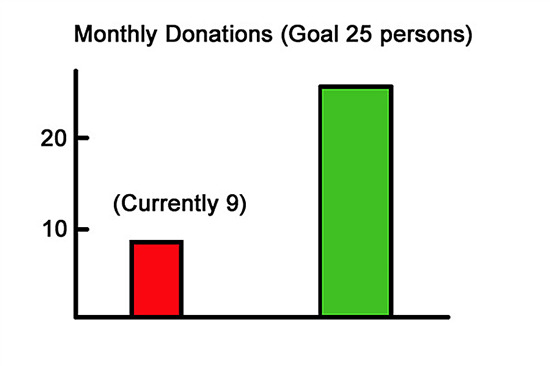 Currently we have only 9 (4) persons who are donating on a monthly basis of $10 or above. Our goal is to have at least 25 persons doing so. If $10 a month is too much of a commitment for you, please consider donating at a $4-$9 level. The following graphic represents where we are as of June 2018. Anything you can do to help us move that red bar upward will be most appreciated. For those of you who do not wish to use our online recurring donation option, please call Sheila and she will work with you to set up a monthly donation through your own bank. 1. First, open our Support Page and fill in your first and last names and preferred email address in the fields marked with a red asterisk (*) – these must be filled in to proceed using this method. 2. Second, click in the field designated ‘Other Amount’ and enter the amount that you wish to donate each month (Note: You do not need to add a dollar sign or decimal point unless you wish to). 3. Third, click on the right hand (‘Monthly Recurring’) button next to the ‘I want to make this donation…’ text. 4. Fourth, then click the ‘Submit’ button and then a new Pay Pal page will open and you follow the prompts on that page by providing the requested data, reviewing the data once you have entered it to make sure it reflects what you wish to do, and then click to appropriate button to complete the transaction. It’s that simple and easy. You will receive a confirming email of thanks from Sheila and another from Pay Pal confirming your first donation payment very soon after completing your data entry (usually within minutes for high speed Internet connections). You will receive follow up emails from Pay Pal every month to document each billing/donation. On behalf of the FWC Board, please accept my sincere appreciation for taking the time to consider this option and for those of you willing to step up and become monthly donors, know that you will be sustaining FWC by becoming part of the gentle, reliable donations stream that we so earnestly desire. Many thanks for your continuing support of the Friends Wilderness Center.